Not to be confused with Casino. Casio was established as Kashio Seisakujo in April 1946 by Tadao Kashio (樫尾忠雄 1917-1993), an engineer specializing in fabrication technology. Kashio's first major product was the yubiwa pipe, a finger ring that would hold a cigarette, allowing the wearer to smoke the cigarette down to its nub while also leaving the wearer's hands free. Japan was impoverished immediately following World War II, so cigarettes were valuable, and the invention was a success. After seeing the electric calculators at the first Business Show in Ginza, Tokyo in 1949, Kashio and his younger brothers (Toshio, Kazuo and Yukio) used their profits from the yubiwa pipe to develop their own calculators. Most of the calculators at that time worked using gears and could be operated by hand using a crank or using a motor (see adding machine). Toshio possessed some knowledge of electronics, and set out to make a calculator using solenoids. The desk-sized calculator was finished in 1954 and was Japan's first electro-mechanical calculator. One of the central and more important innovations of the calculator was its adoption of the 10-key number pad; at that time other calculators were using a "full keypad", which meant that each place in the number (1s, 10s, 100s, etc ... ) had nine keys. Another distinguishing innovation was the use of a single display window instead of the three display windows (one for each argument and one for the answer) used in other calculators. Casio Computer Co., Ltd. was formed in June 1957. That year, Casio released the Model 14-A, sold for 485,000 yen, the world's first all-electric compact calculator, which was based on relay technology. In the 1980s, its budget electronic instruments and its line of affordable home electronic musical keyboard instruments became popular. The company also became well known for the wide variety and innovation of its wristwatches. It was one of the earliest manufacturers of quartz watches, both digital and analog. It also began selling calculator watches during this time. It was one of the first manufacturers of watches that could display the time in many different time zones and of watches with temperature, atmospheric-pressure, altitude, and even Global Positioning System displays. A number of notable digital camera innovations have been made by Casio, including the QV-10, the first consumer digital camera with an LCD screen on the back (developed by a team led by Hiroyuki Suetaka in 1995), the first consumer three megapixel camera, the first true ultra-compact model, and the first digital camera to incorporate ceramic lens technology. Casio's products include watches, calculators, electronic keyboards and other digital music instruments such as digital cameras (Exilim series), film cameras, cash registers, laptops and sub-notebook computers, mobile phones, PDAs (E-Data Bank), electronic dictionaries, digital diaries (early PDAs), electronic games, computer printers, clocks, and portable televisions. In the 1970s and 80s, Casio was best known for its electronic (including scientific) calculators and electronic musical instruments and affordable digital watches incorporating innovative technology. Today, Casio is most commonly known for making durable and reliable electronic products. The G-Shock range of shock-resistant watches is popular, with the 1983 G-Shock DW-5600C being highly sought-after by collectors. The scientific calculators made by Casio especially the CLASSWIZ series of calculators are known for being affordable while incorporating a host of functions as compared to their competitors. Casio also makes products for local markets, including "Prayer Compass" watch series designed to help Muslims pray on time and in the right direction. Note: This is a list of selected calculators. Figures in parentheses show approximate year of introduction. Note: This is a list of selected models. Note: Only Notable watches are mentioned in this heading. ^ a b c d "History". 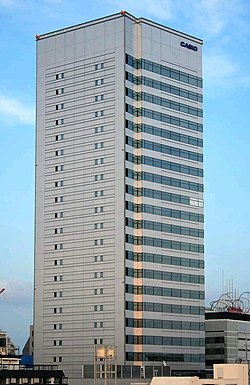 Casio Computer Co., Ltd. Retrieved 30 April 2012. ^ "Notice of Kazuo Kashio's Passing of Chairman and Representative Director". Retrieved 19 June 2018. ^ "CASIO Annual Report 2017" (PDF). CASIO. Retrieved 8 August 2017. ^ "CASIO Annual Report 2017" (PDF). CASIO. Retrieved 28 February 2019. ^ "Employees". CASIO. Retrieved 8 August 2017. ^ "CASIO Corporate History 1954". CASIO-Europe. CASIO Europe GmbH. Archived from the original on 19 February 2016. Retrieved 13 February 2016. ^ "Tadao Kashio Biography: History of Casio Computer Company". ^ Casio desktop calculator Archived 12 January 2008 at the Wayback Machine by Dentaku Museum. ^ "Casio CLASSWIZ FX-991EX Full Review". Retrieved 25 February 2019. ^ "PRAYER COMPASS". Casio. Retrieved 22 March 2015. ^ "Casio PT-80". Synthmuseum. Retrieved 7 September 2015. ^ "The Museum". old-computers.com. Archived from the original on 2010-11-21. Retrieved 2016-09-27.